It’s late Saturday night in Chicago and I’m heading off to sleep so I can catch my noon flight home tomorrow. Adepticon has been awesome, seeing old friends and making new friends is always great. I have seen a lot of cool products here (and bought a fair few also) ,,, so there will be lots to talk about and show on the podcasts. I’ll get to work on creating shows in the next few days. I get home at 3pm tomorrow and go straight to work,,, so there is not likely to be a podcast tomorrow night ,,, but soon, trust me. Take care guys,,,,,,, and keep on gaming. My hotel is still having internet issues so I’m not uploading much yet ,,, but today was a good day. 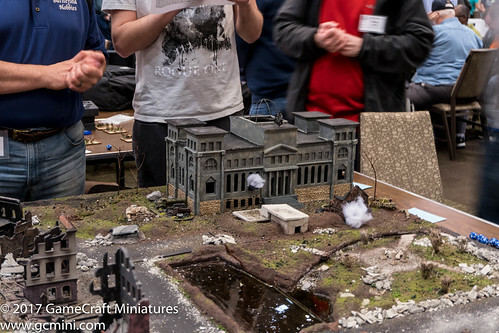 Today I played in my first-ever Bolt Action tournament, the BA Doubles tournament. My doubles partner Paul Walker (from the War Room podcast) and I won the first round which was against Pat and Jeff of the SNAFU podcast … this was the battle of the podcasts. It was a very fun game with great people. We lost our second game, but it was close. We had our asses handed to us on the third round. So, overall we did not do terribly bad, and in the end we won the “Best Sportsman” award for the tournament. I am creating a lot of content (video, audio, and photos) here at GenCon to share with you guys In The Game Room Podcast. Stay tuned ,,, I may have to wait till I get home to share any of it. The Internet at this hotel is stressed beyond capacity, the hotel is full of gamers, each with multiple wireless devices … Getting online here is worse than the days of the 9600 baud dial-up model (there are young people that don’t even know what that means) … Uploading loads of images or large video or audio files is just not an option right now.